The American Indian collection features more than 200 objects including pottery, basketry, quill and beadwork, textiles, painting and sculpture. The holdings are distinguished by numbers of recognized masterworks. 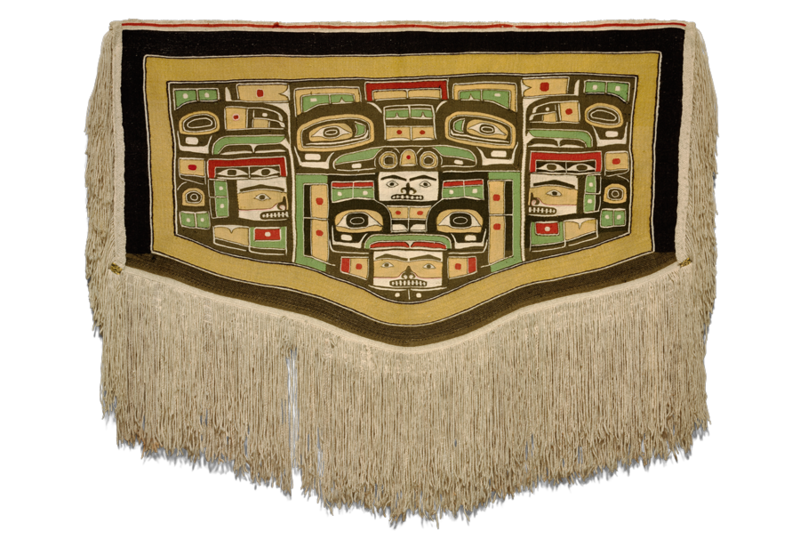 Beyond individual pieces, are strengths in historical works from the Pacific Northwest Coast, Plains and Southeastern Woodlands and in both historical and contemporary works from the Southwest. In 1933, crates of American Indian objects arrived at the Nelson-Atkins filled with works purchased from the Fred Harvey Company in Kansas City and the Museum of the American Indian/Heye Foundation in New York (now the National Museum of the American Indian). For the next seven decades, the Kansas City community generously gave American Indian works to the museum for its growing collection. 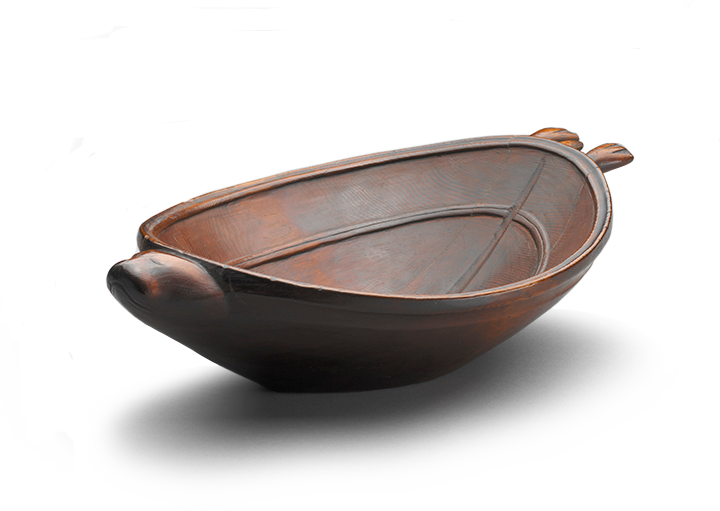 In 2001, a gift of 170 objects from Donald D. Jones, together with a fund for acquisitions, sparked the completion of the original trustees’ vision. In 2002, Fred and Virginia Merrill endowed a curatorship, a department of American Indian art was established and Gaylord Torrence was hired as founding curator. In 2009, a suite of three galleries dedicated to the art of Native peoples, and featuring more than 200 works, opened at the museum. New gifts and purchases from around the country, along with the 2009 gift from Morton and Estelle Sosland of their private collection of Pacific Northwest Coast works of art, made the broad presentation possible. The collection continues to expand today, most notably with the 2013 gift from Joanne and Lee Lyon of early Plateau material and rare Southeastern bandolier bags. 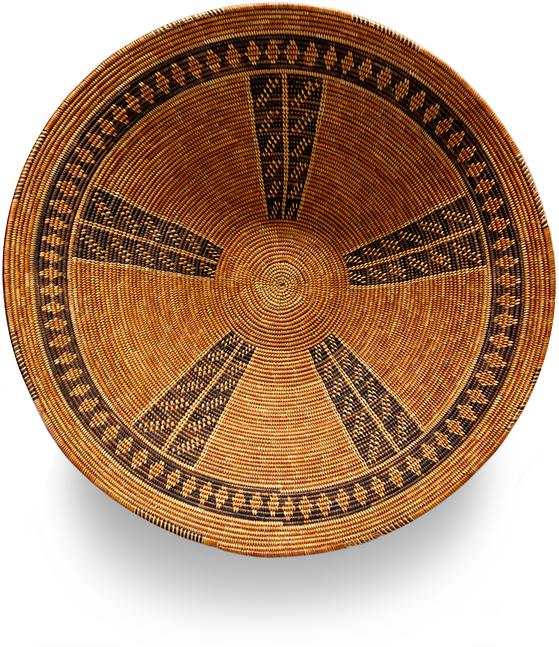 Basket, Chumash, ca. 1820. Juncus rush and sumac, h x diam: 5 1/2 x 20 3/4 inches. Purchase: William Rockhill Nelson Trust, 31-125/127. Leekya Deyuse, Fetish Necklace, ca. 1935. Leekya Deyuse (1889-1966), Zuni, New Mexico. Fetish Necklace, ca. 1935. 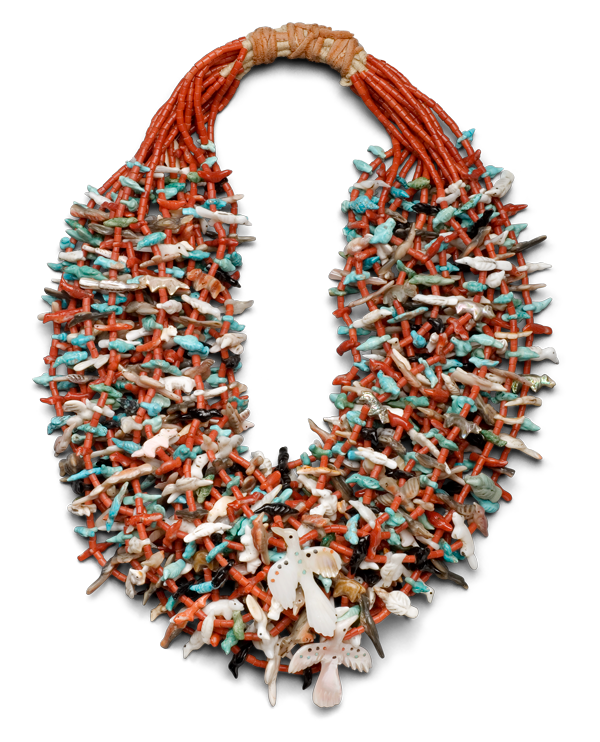 Coral, shell, turquoise, jet, cotton cord, and leather, length: 16 inches. Gift of Mrs. David T. Beals, 68-5/12. Mary Ebbetts Hunt,Chilkat Robe, ca. 1880–1900. Mary Ebbetts Hunt (Anisalaga), Tlingit, Southeast Alaska (1823–1919).Chilkat Robe, ca. 1880–1900. Mountain goat wool, commercial wool yarn and yellow cedar bark, 34 x 60 inches. From the Estelle and Morton Sosland Collection, 49.2008.16. Tab Bag, Eastern Great Lakes, ca. 1800. Black-dyed native leather, porcupine quills, metal cones, deer hair, and silk ribbon, 20 1/4 x 6 inches. Purchase: the Donald D. Jones Fund for American Indian Art, 2004.17. 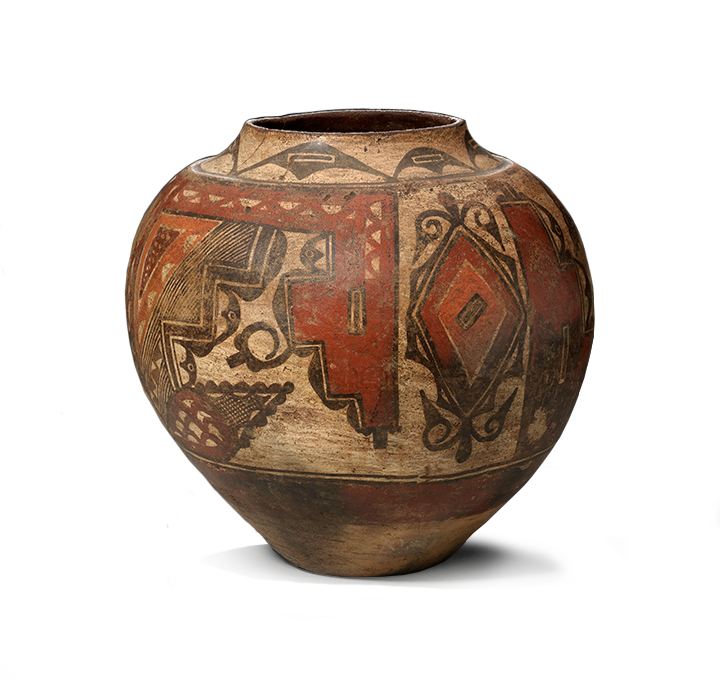 Jar, Santa Ana Polychrome, Santa Ana, New Mexico, ca. 1820. Clay and pigment, height: 14 1/4 inches. Purchase: William Rockhill Nelson Trust, 33-1157. Shield, Arikara artist, North Dakota, ca. 1850. 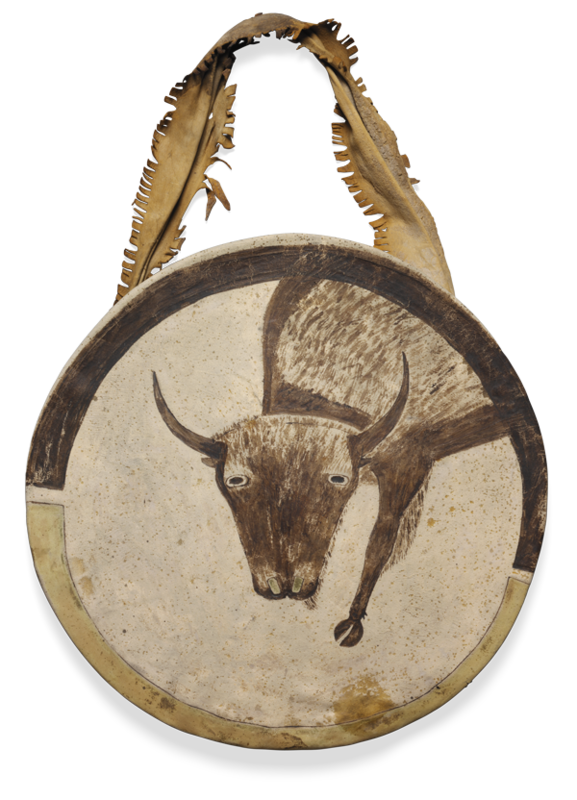 Buffalo rawhide, native tanned leather, pigment, Diameter: 20 inches. The Nelson-Atkins Museum of Art, Kansas City, Missouri, Purchase: the Donald D. Jones Fund for American Indian Art, 2004.35. Eagle Feather Headdress, ca. 1875. 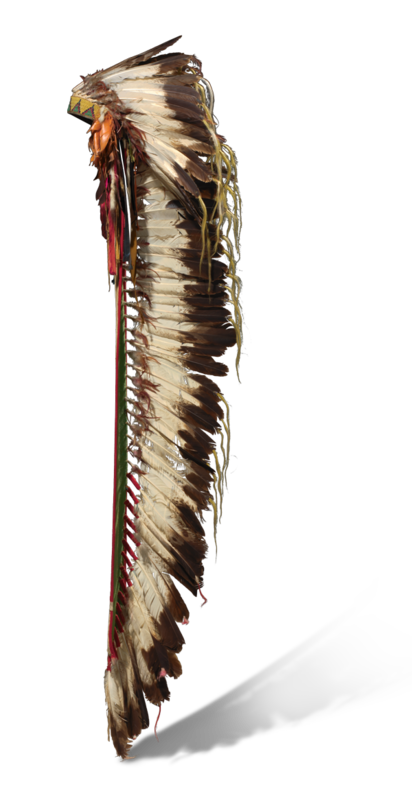 Eagle Feather Headdress, Northern Cheyenne, Montana, ca. 1875. 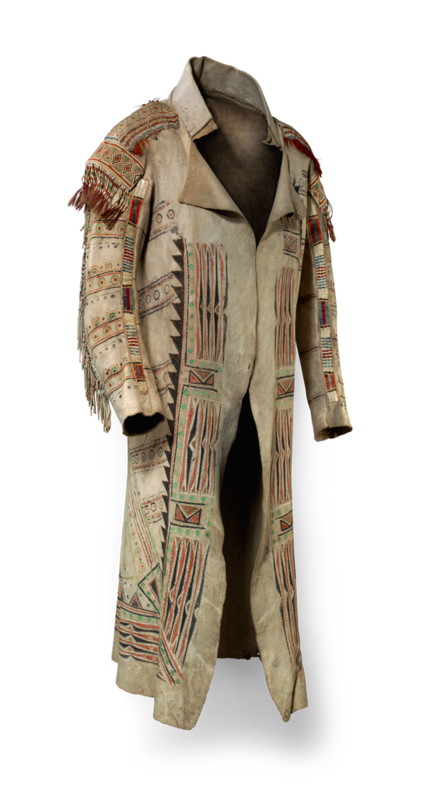 Eagle, hawk, owl and raven feathers, rawhide, native leather, wool and cotton cloth, glass beads, ermine skin, silk ribbon, and horsehair, height: 70 inches. Purchase: William Rockhill Nelson Trust, 31-125/38. First Phase Chief Blanket, ca. 1850. 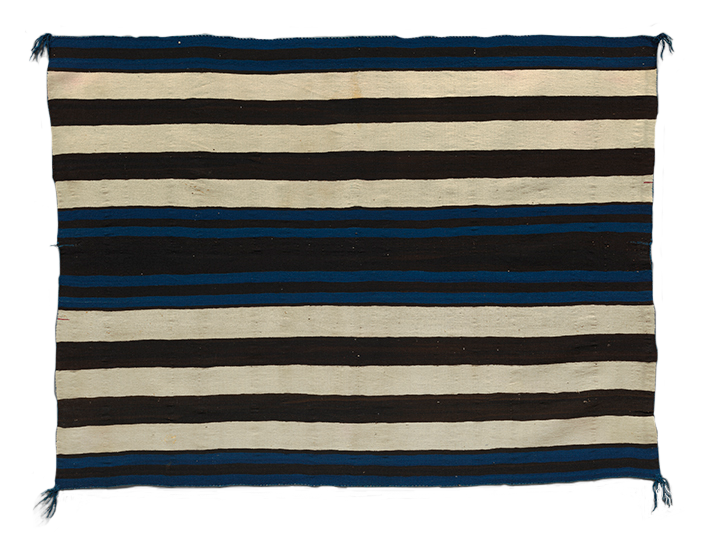 First Phase Chief Blanket, Navajo, Arizona or New Mexico, ca. 1850. Handspun wool and indigo dye, 51 × 69 3/4 inches. Purchase: William Rockhill Nelson Trust, 33-1430. Dzunukwa Mask or Gikamhl (Chief’s Mask), ca. 1870. 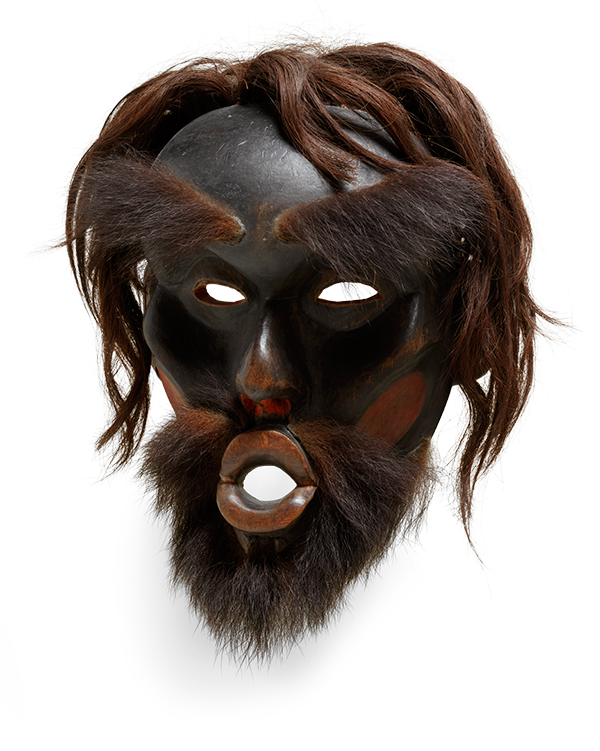 Dzunukwa Mask or Gikamhl (Chief’s Mask), Kwakwaka’wakw (Kwakiutl), British Columbia, ca. 1870. Wood (alder), pigment, human hair and bear hide, 11 x 7 5/8 x 5 3/4 inches without hair. From the Estelle and Morton Sosland Collection, 2009.41.1. Coat, Ojibwa, Ontario, Canada, ca. 1789. Native leather, rawhide, pigment, porcupine quills, glass beads and deer hair, 48 7/8 x 27 5/8 inches. Gift of Ned Jalbert in honor of the 75th anniversary of The Nelson-Atkins Museum of Art and funds from the exchange of William Rockhill Nelson Trust properties, 2008.1. Seal Bowl, Chugach (Alutiiq), ca. 1780-1820. Wood (probably alder or birch), 3 5/8 x 12 1/4 x 8 inches. From the Estelle and Morton Sosland Collection, 2009.41.7. Jamie Okuma (b. 1977), Luiseño/Shoshone-Bannock, California. Adaptation, 2011. 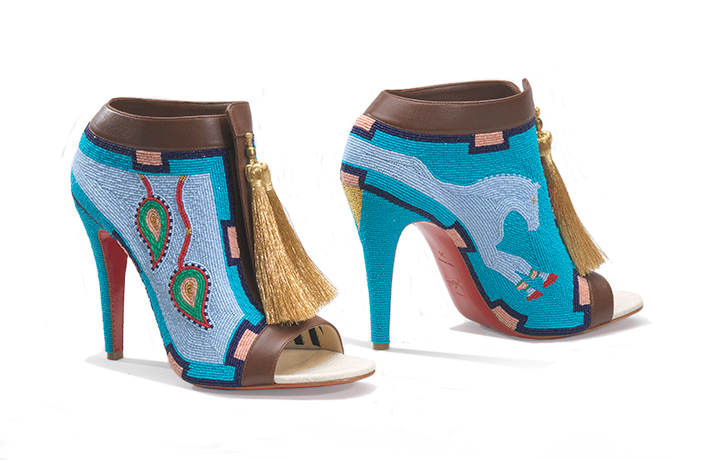 Shoes designed by Christian Louboutin, Paris (Chaotic 100 ankle boots: canvas, commercial leather), glass and 24k gold-plated beads, polyester tassels, 6 1/2 x 3 3/8 x 8 1/2 inches. Purchase: the A. Keith Brodkin Fund for the Acquisition of Contemporary American Indian Art, 2011.42.A,B. © Jamie Okuma.